Say the name Wayne Rooney to a typical football fan, and you will provoke all sorts of reactions. The last comes mostly as a result of his seemlingly frequent contract negotiations, a story that is again in the news this week because… well, he’s negotiating a new contract. Does Rooney deserve a monster new contract, likely to be the richest ever in England? How good has Rooney been, really? Our mythbusting series is designed to cut through the hype and focus on statistical production to try and answer exactly that. Before we embark on our journey through five years of Wayne, here’s something to keep in mind: During which of the last 4.5 seasons has Wayne Rooney been the best player in England? 182 shots, spread across 30 full games made for Rooney’s highest Shots per 90 in his career. 22 non-penalty goals coupled with 3 assists made for a scoring contribution of .82 per 90, an excellent total. Scratch beneath the surface, however, and you see some imperfections. Six shots a game is a lot, and it doesn’t look as though Rooney was fully comfortable with that load, because only putting 32% of those shots on target is dreadful. It’s almost as if Rooney saw what his former Portguese teammate was doing at Real Madrid and decided to have a go at it himself. Didier Drogba was unequivocally the best scorer in the Premier League this season, and Chelsea won the title. This was the season Rooney said he wanted to leave, not because of money, but because of “ambition.” (A line that’s become irritatingly familiar to Arsenal fans over the last eight years, but United are the richest club in the land.) 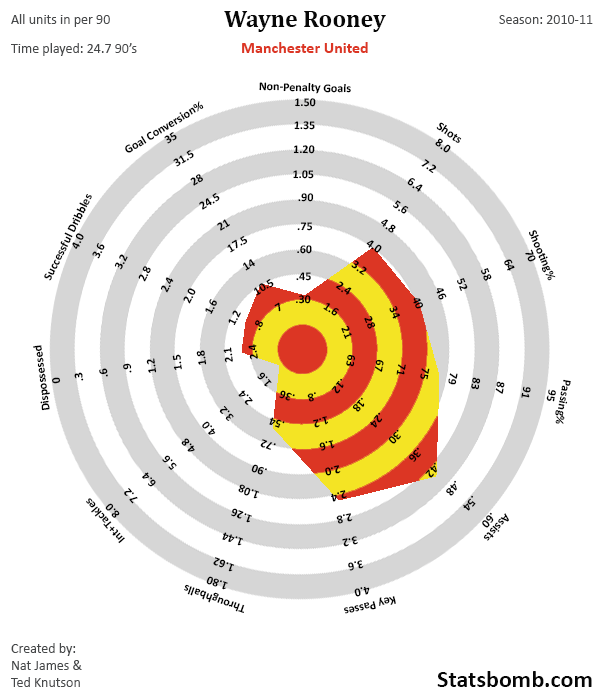 Whether it was the ankle injury, or Sir Alex punishing Rooney by moving him out of position, or some other more esoteric reason, Rooney’s stats profile changed fairly dramatically. Goal conversion this year dropped all the way down to 11%, which is way below league average for a forward. 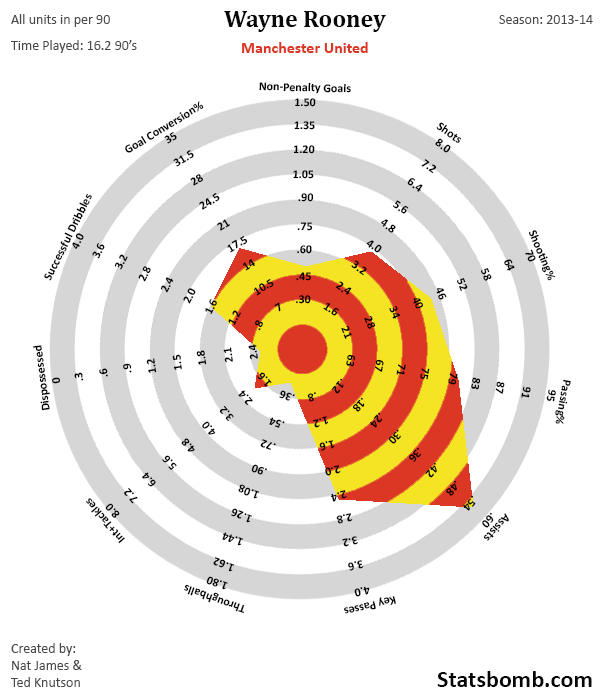 It’s also the only time in the last five years where Rooney’s goalscoring looks pedestrian, all the way down at .32 non-penalty goals per 90. In exchange, however, we now see creative Rooney at the fore. Assists per 90 went from 1 every 10 games in 09-10 to nearly 1 every 2. Key passes are up, throughballs are outstanding, while the rest of Rooney’s stats basically stayed the same. His overall scoring contribution went from .82 the year before to… .76 this season. Nearly identical, but a big shift in composition. United won the league this year by 9 points. 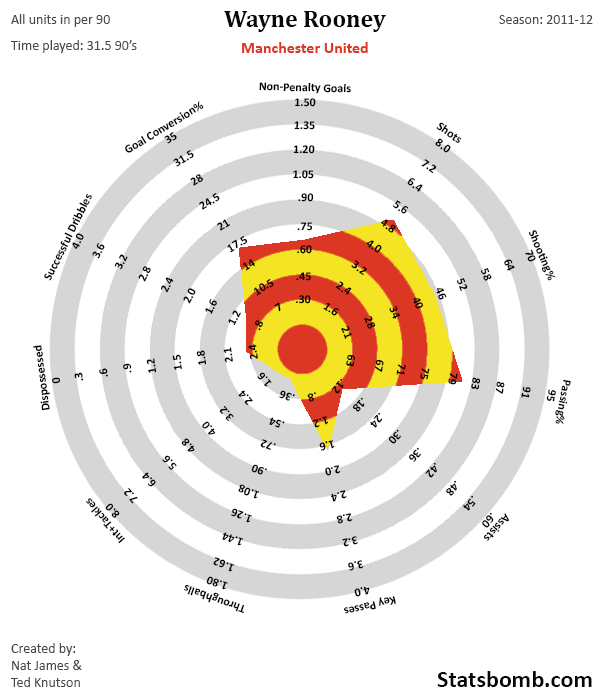 Tevez and Berbatov technically lead the league in goals, but Robin van Persie was the best scorer in the league by far, with 16 goals non-penalty goals and 7 assists in 19.6 90’s and a monster scoring contribution of 1.17. Note, however, that assists and key passes are way down compared to the season prior, and also to Rooney’s career as a whole. There’s an interesting Dr. Shrekyl and Mr. Hyde dichotomy to Rooney’s performance in his middle seasons at Manchester United. Regardless of how good Rooney actually was that year, the only thing anybody remembers from the entire season is Aguero’s incredible league winner in the 93rd minute of the final game, and the looks on United fans’ faces as they went from celebrating yet another league title to being pipped by their “noisy neighbors” at the very very death. 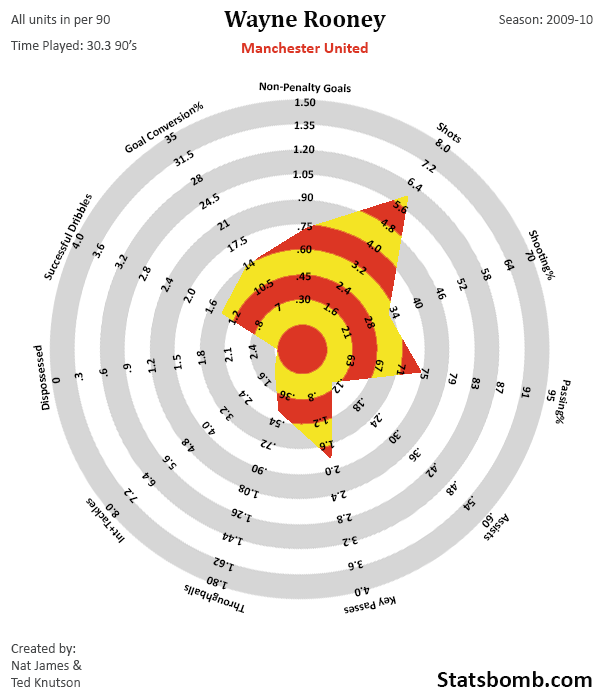 Robin van Persie won the golden boot at Arsenal that year, with a ridiculous 30 goals plus 9 assist season, and a scoring contribution of .99. What happens when you take the best scorer in the Premier League and add him to the team that finished second in the league by the finest of margins? United score absolute bucketloads of goals, Fergie walks out the door holding yet another Premier League title, and no one in the analytics community can tell you exactly how they did it. That, however, is a confusing story for another time, as we’re still here to talk about Wayne Rooney. Rooney “only” produced 11 non-penalty goals and 10 assists this season, but he also only played 22.4 90’s, meaning a 2012-13 that was filled with some injuries and more clashes with Sir Alex actually saw Rooney produce the best scoring contribution so far. .49 NPG plus .45 assist works out to .94 goals per 90 minutes on the pitch. Shooting accuracy was down a bit, but still near 41%, which is acceptable, especially since Rooney played deeper this season. Key passes were back up, as were throughballs, and Rooney contributed more on the defensive end as well. As mentioned above, United destroyed the rest of the league this year. Robin van Persie won another golden boot, but when you strip out penalties… the best scoring rate in the league belonged to Wayne. Hot on the heels of possibly his best season, and a year in which Rooney secretly lead the league in scoring, Rooney faced his toughest challenge: Playing in a team managed by David Moyes. Conversion rate is hovering close to 17% again, an excellent number. Shooting accuracy is good, and though shots are at the lowest rate in the five-season sample, Rooney is firing in goals at an identical rate to last year. Additionally, this is the best season he has had at setting up teammates, and this is despite the fact that he and van Persie haven’t actually played together that often. An assist rate of .56 is tremendous, and key passes floating around 2.5 makes Rooney one of the top 5 most creative players in the league. It’s not just the offensive numbers that are up though – Rooney’s defensive contribution is the highest we have seen, and he’s completing 1.6 successful dribbles a game too, again the highest in the sample. So Rooney’s scoring contribution is now 1.05, and likely the highest in his career. If Luis Suarez, Sergio Aguero, and Daniel Sturridge also weren’t playing completely out of their minds (and they totally are), Rooney would be an easy favourite to again lead the league in scoring rate. Instead, he’s 4th in a year where all sorts of guys have gone completely bananas. A lot of things I personally did not expect when I started digging in to the data. I did not realize that Rooney lead the league in normalized scoring contribution last season. Rooney is actually experiencing his best season in recent times across a large number of metrics this year. Looking at the data, it’s fairly clear that Rooney’s best role is as a second striker or playmaker. His key pass numbers aren’t up there with Ozil or Silva, but they are high, and Rooney’s goalscoring still eclipses either of the playmaking maestros by some distance. Rooney has only been the best scorer in one of the last 4.5 seasons, but he’s been close every single time. That sort of consistency in what is one of the toughest leagues in the world to score in, is damned impressive. There’s a loaded question. Does anyone, let alone any athlete, deserve £15M a year? That’s too philosophical to answer either way. 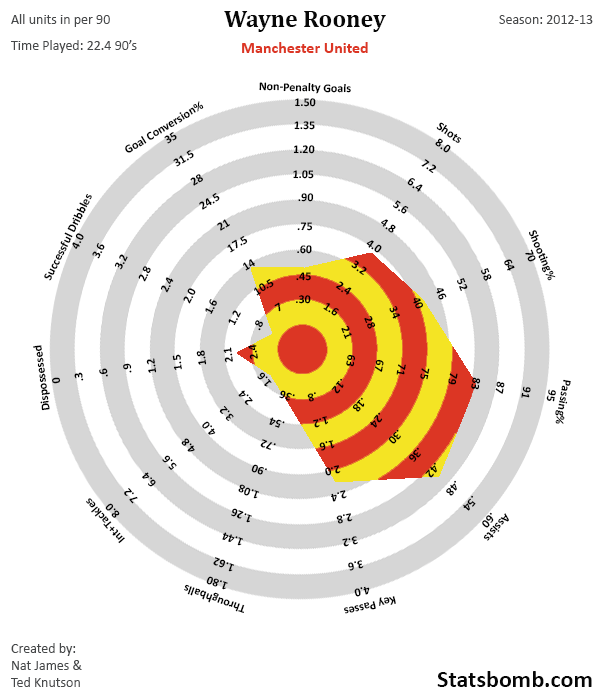 However, make no bones about it, Wayne Rooney is probably the best overall scorer the Premier League has seen in the last half decade (for what it’s worth, I actually think Fabregas had a chance at this if he’d stayed at Arsenal, but alas…). Additionally, while I would normally be worried about falling production in a 28-year-old forward, Rooney has two very important things working for him. 1) His best role is as a more cerebral playmaker (I know, I know… the jokes write themselves), which means a marginal loss in pace or physical ability will not affect him as much as it would a speed striker. 2) Even though people might not know it, at 28, he is currently experiencing his best season in recent times. Is it sustainable? Nobody really knows. However, even if this is the peak, a new 3- or 4-year deal at this point probably won’t smart too much in the last season of the deal unless Rooney has serious injury problems, something to this point he has completely avoided. Conclusion: Wayne Rooney? Probably even better than you think.